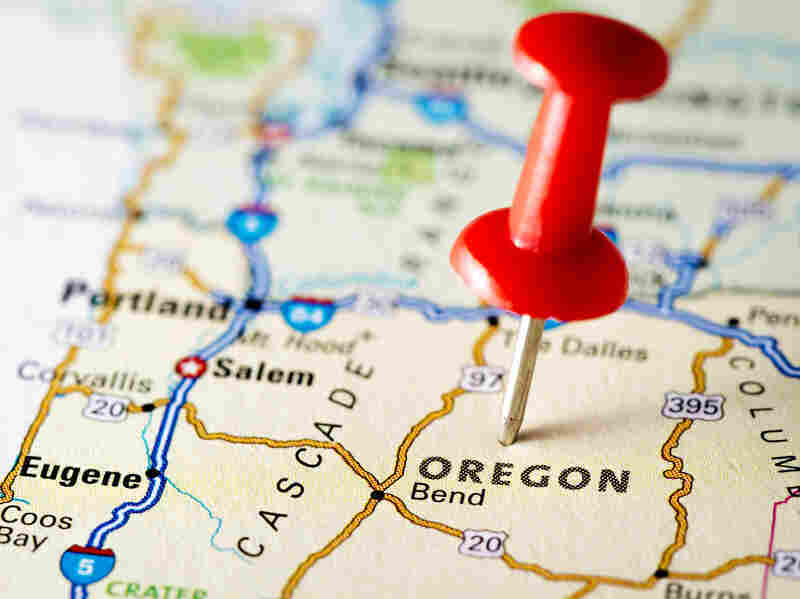 As Deadline Nears, State Insurance Exchanges Still A Mixed Bag : Shots - Health News Some of the 14 states running their own health insurance marketplaces lag behind the federal site in meeting enrollment goals. States doing better kept the IT goals relatively simple, reviewers say. But what's happening in the 14 states that are running their own exchanges? Oregon, for example, has only just gotten its website up and running this week. It's still not fully open to the public, though insurance agents and other community representatives certified to use the system can now help individuals enroll online. Until now, Oregon had been using paper applications. "The states that said, 'This is complicated — we're going to focus on the most essential issues,' those were the states that tended to do better," he says. "Unfortunately states that I once touted as the leaders — Maryland, Oregon, Minnesota," are among those bringing up the rear, he acknowledges. "This is a complicated undertaking, and so people who tried to do too much in [the first year], I think, had some problems with that." Maryland and Minnesota haven't had the same problems as Oregon, but their websites have both been working only intermittently, and enrollment has lagged. Just as with the federal website, part of the problem has been on the information technology side. "We've seen in some states that some vendors have not been able to deliver, and states have struggled with the IT implementation," said Heather Howard, who advises states for the Robert Wood Johnson Foundation. In Maryland, fixing the exchange has been complicated by the fact that two of its IT vendors are suing each other. Massachusetts and Vermont have both had issues with CGI, the vendor that was found responsible for most of the messy rollout of the federal site, HealthCare.gov. But experts say blame for failure — and credit for success — doesn't all belong to the outside IT contractors. It's also due in large measure to how well those contractors worked with state officials. Audrey Haynes oversees Kentucky's largely successful exchange, Kynect. She says one key to making it work was putting the exchange in the same department that runs Medicaid. "Anyone knows that Medicaid has to have a pretty super IT department that supports it," she said at a recent event sponsored by the Robert Wood Johnson Foundation. "So we have a lot of experience ... at bringing up large IT structures." And where do state exchanges go from here? Republican members of Congress from Maryland and Oregon are asking the federal government to investigate the limping exchanges in those states. That's because both received millions of federal dollars to set up their health insurance marketplaces. In principle, says consultant Joel Ario, figuring out what went wrong is not a bad idea. "I certainly think we want to look carefully at what happened and learn some lessons here. I don't think anybody's going to find any improprieties here, because they're going to think it was all well-intentioned activity." And in the long run, once the states that are lagging work out their IT problems, they will probably end up, much like California, doing better than the states being run by the federal government. Heather Howard says that's because states running their own exchanges also have more resources for consumer outreach. "They have consumer assistance infrastructure, grants out to community-based organizations, and they're building and doing a lot more marketing," Howard says. "And their consumers are hearing much more about the options." All of which merely underscores something important about the health law that hasn't changed: What's available to you depends very much on where you live.